Since the forties, San Francisco photographer Fred Lyon has shot (and made famous) California’s greatest designers, from Michael Taylor and John Dickinson to Anthony Hail, Frances Elkins and Suzanne Tucker. 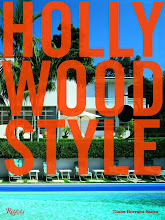 He is California’s Horst, recording top designers, their stylish clients, and all the houses that matter. Come with me to meet the Great Fred and see the images he crafted for John Dickinson and Michael Taylor. Fred Lyon by Steve Frisch. 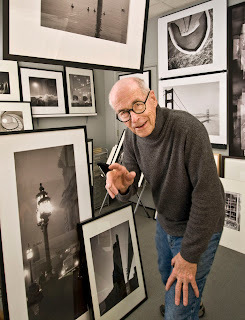 Fred Lyon is talented, charming and ineffably elegant. He defines dapper. When he walks into a party, the whole room lights up. Think strobe lights! He is also the most talented classic photographer—with a lifetime of magazine covers, books, and designer portfolios in his San Francisco studio. He’s California’s Horst and Irving Penn with a touch of Bruce Weber. A San Francisco native, he left in his teen years for war and a stint in New York, and returned home in 1947 armed with a single camera. Vogue and House & Garden quickly found him. Fred, now in his eighties, creates black and white and color photographs of quiet, classic beauty. 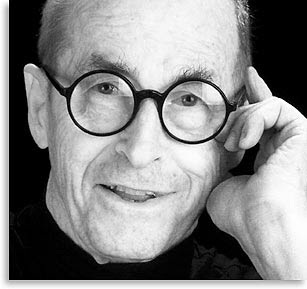 His design images for the last sixty years have been naturally lit with no artificial or over-lit effects. 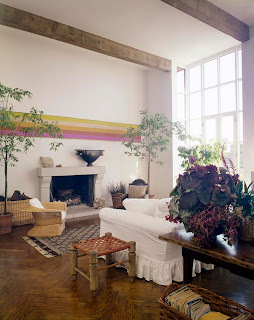 Above, Fred Lyon’s images of Michael Taylor’s designs, spanning three decades, include Michael Taylor in his studio; master mix of textures and materials at a house on the Peninsula include gilded girandoles, zebra-skin covered occasional chairs, and a Greek flokati run (combed sheepskin) that was fashionable at the time; a sunroom on the Peninsula (just south of San Francisco) has all the Michael Taylor elements including white slipcovers, dramatic plants in pots, versatile occasional chairs and lots of fresh air; Michael Taylor studio/shop setting in downtown San Francisco shows the white paint he threw around with abandon; perhaps his most famous bedroom, from the fifties, included the mix of baroque and simple that he carried through his design career. 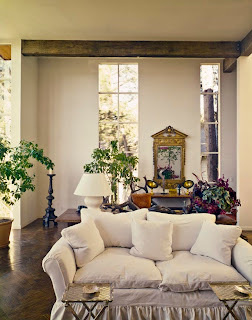 Fred Lyon shot Michael Taylor’s interiors from the beginning of Taylor’s long career. 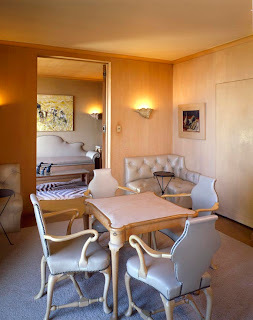 The rooms Michael designed for his clients were full of possibility, waiting for the flourish he would add for the camera, said the photographer. Taylor worked on the fly, improvising as the photo shoot went from room to room, said Lyon. 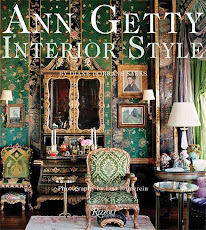 To the chagrin of the grande dame that lived in the mansion, her maid’s room soon appeared in full glory on the cover of House & Garden. “I started shooting Michael Taylor’s work in 1954 when he was in partnership with Frances Mihailoff, and the first thing he ever had published was the Christmas tree in their studio,” Lyon said. 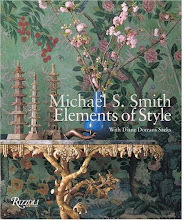 Michael Taylor started his own firm in 1956, and opened his famous studio on Sutter Street in 1960. 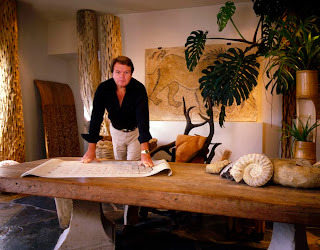 “He was the hottest thing in California, and enormously influential in decorating then and now,” said Lyon. 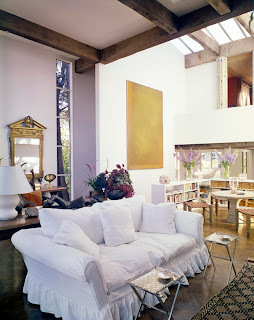 “I always knew he was one of the first superstar decorators, restless, imposing, always exploring new design ideas. Lyon is certain that Taylor was dyslexic. One reason was that Taylor could not pronounce ‘hydrangea’. 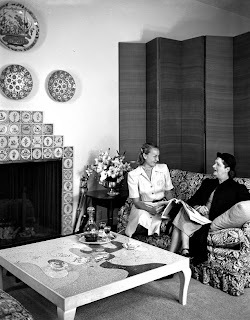 Above, a Frances Elkins portrait; Frances Elkins (spit curls in place) with a client in the fifties; the flower-filled historic Monterey adobe house where Frances Elkins lived (note the fireplace surround faked with fretwork and painted wood); the lovely dining room in the adobe with the table set with her collection of Venetian glass; a game room in a Pacific Heights mansion in San Francisco with Elkins’ Georgian-inspired chairs, which are all still at the house now owned by art collectors. 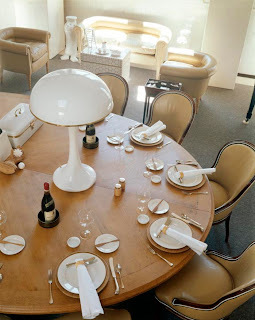 Taylor was not the only dictatorial decorator Lyon photographed. Frances Elkins, like most women at the time, did not drive. She had a car and driver and would head from Monterey to San Francisco for client meetings. Fred Lyon and his elegant blonde wife, Anne Murray Lyon were fixtures on the social scene and regulars on Herb Caen’s column for decades. Anne, who died thirteen years ago, had been one of Richard Avedon’s favorite models. 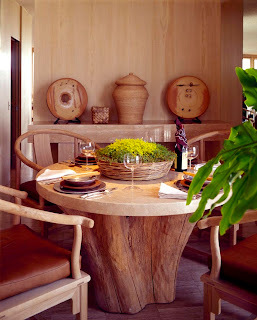 Fred Lyon today is in demand to shoot interiors for top designers, and wineries around the world for leading magazines. 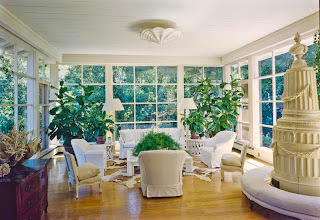 FL: Whitney Warren’s Telegraph Hill house was my first assignment for House & Garden, in 1948. Whitney was heir to a large fortune and a noted bon vivant. 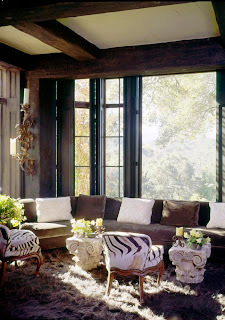 Impressive for its sheer opulence and the Gardner Dailey designed space, the house had a very dramatic library. 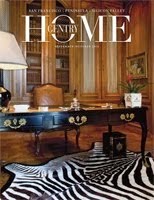 House & Garden ran my picture of the classical French-inspired library as a full color page. Footnote to this shoot: The magazine had advised me that a woman would be on hand to be sure that everything looked right. We didn’t talk much and only later did I learn of the legendary stature of Frances Elkins. 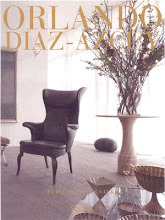 DDS: What was the craziest thing a House & Garden in the golden era Editor ever did to get great pictures? FL: They would badger and boss their targets. 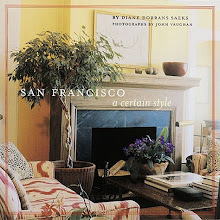 But in1967, House & Garden’s San Francisco editor, Dorothea Walker, approached Dorothy Fay, a social figure, for a third time about scheduling photography of her Aptos beach house. Mrs. Fay protested, “The house isn’t ready. I’ve been begging Michael Taylor for over two years to finish it, but you know how Michael is.” Dorothea thought for a moment, then, “Do you really want it done?” Dorothy: “Of course!” Dorothea: “Then you just tell Michael that Fred Lyon is coming to photograph—and he will finish it.” In total disbelief Dorothy Fay tried it. Michael put the final touches on it, right in front of my camera. Another homeowner astounded at the power of photography. DDS: What camera did you use to capture these wonderful images before digital? FL: Sometimes I worked with the small Rolleiflex and Hasselblads, but primarily the 4 x 5 Linhof and Sinar. Sometimes I shot 5 x 7, but now I can’t remember why. Let me say this about photography: I’ve always been a photojournalist, a storyteller. So shooting interiors has been about explaining how the room works with its key components, well composed, but without any photo artifice. 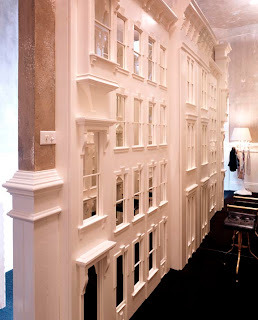 The architect, the owner, the interior designer have all visited their creative efforts on the space. Unlike any of my other work, this seemed to be the last place to impress my personality. On the face of it, photography is a rude process, freezing motion, sometimes straining out color, squashing the subject flat, and imprisoning it in a rectangle, so it’s already at a disadvantage. Architectural/interior photography then is unique in that, while it benefits from a warm, sympathetic eye, its chief requirements are painstaking craftsmanship, patience, a strong back, and comfortable shoes. DDS: Michael Taylor was great. 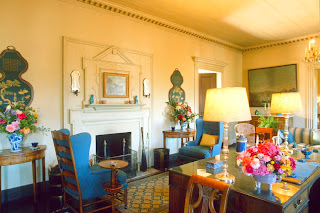 FL: In 1970, we labored for three days in the Diana and Gorham Knowles house in San Francisco. It had everything, no holds barred. 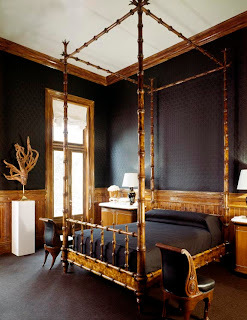 Great spaces, endless marble and crystal chandeliers, paintings of fine provenance. Michael and his colleague Mimi London were at the time orgasmic over their giant geodes and orchids. Finally, having exhausted all the obvious rooms, my camera was set up on the twisty attic stairs, looking into a tiny maid’s room with little to recommend it. Michael, in one of his unstoppable bursts of inspiration, wrestled planks and supports up the stairs and behind the sofa. He positioned a dozen large white potted hydrangeas to emerge over the back of the sofa. 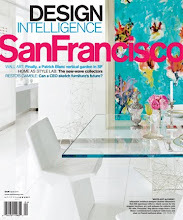 A few months later it appeared on the cover of House & Garden, the only image they ever used from that shoot. DDS: John Dickinson was so discreet and private. But for the famous House & Garden shoot of the Firehouse, he allowed H&G editors to turn his work table into a dining table. How many days were you shooting at the Firehouse and how was it to shoot with John Dickinson? FL: We were there probably three or four days over a period of time and it was all fun. My camera loved John’s work, and his wry wit was a continuing delight. He complained that none of the many magazine pages we’d crafted had ever brought him a single client. When I joked that he should add printed chintz and swagged draperies to his rooms, he greeted the idea with a snort. But he created such ingenious--and irreverent—designs that all the efforts we shared seemed a joy. 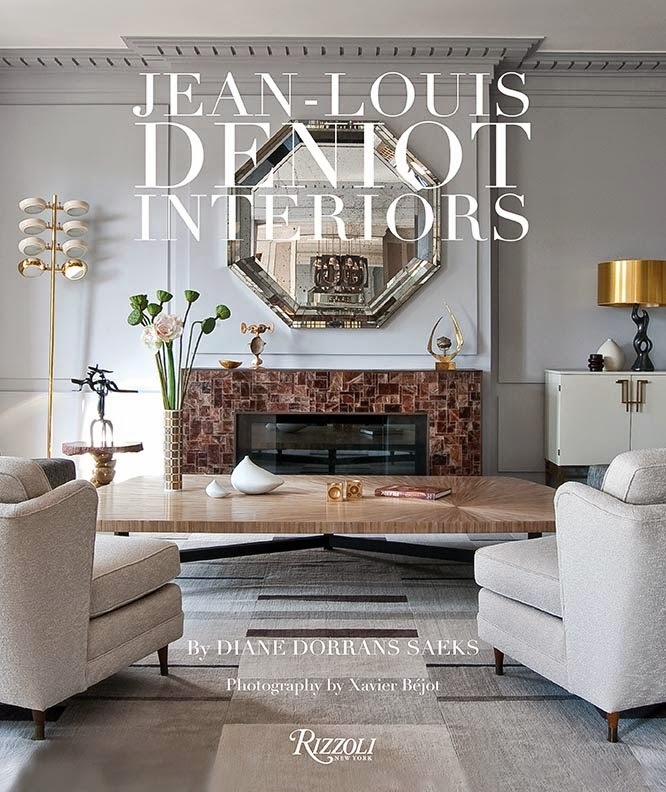 DDS: Frances Elkins was the first to import Jean-Michel Frank furniture. She palled around with Christian Berard. 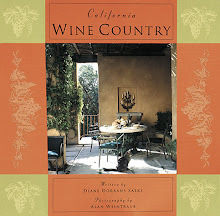 She was the first to bring Jean-Michel Frank to California. What was her mystique with clients? FL: She was simply brilliant, confident, with ballast from her brother David Adler. 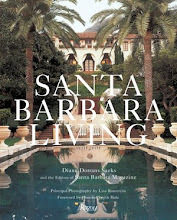 She anchored the unbeatable triumvirate of that era—architect Gardner Dailey, landscape designer Thomas Church, and Frances. Certainly she was authoritative, ready to do battle with wealthy clients over points of taste. But if they were eager to learn, she told me the famous rows with clients resulted in some of her best solutions. 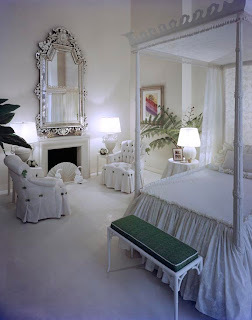 Her rooms were so good that I could point my camera in any direction with no need for tweaking furniture or accessories. 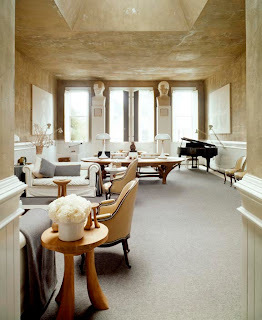 Her rooms that exist today are fresh and timeless, a lesson in great design. DDS: Your career has been a fabulous one. Today you travel around the world shooting wineries and wine country landscapes, you are one of the great social figures, and beloved by all. What is the secret of your success? FL: Well, thank you, but I’m not that good. My life thus far has been a series of glorious mistakes where I innocently backed into opportunities with delicious results. And then, hard work helps. But my greatest good fortune has been working with a nonstop parade of extraordinary people. They are constant inspiration, making me try harder. And now I have come full circle: A collection of my black-and-white pictures from the 1940s and 50s is being beautifully reproduced in a new book. 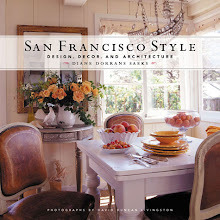 SAN FRANCISCO THEN, available in January, boasts an introduction by ex-mayor Willie Brown. A show of the prints is planned for next year at Modernbook Gallery in Palo Alto, home of the publisher, Modernbook Editions. Above, John Dickinson’s legendary Firehouse in San Francisco, photographed by Fred Lyon. 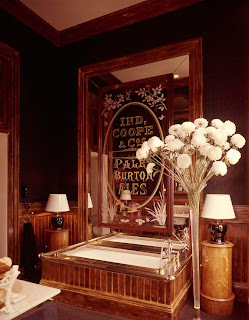 The bathroom, with horsehair walls, had a series of ornate gilded antique pub mirrors which were torn out by a subsequent owner because he said they were ‘too gay’; the high-ceilinged bedroom, formerly the firemen’s dorm, had a custom faux bamboo bed and new/antiqued wainscot; white wardrobe doors were custom crafted to look like Victorian house facades; the studio/living room with the John Dickinson-designed African-inspired tables, industrial grey carpet and leather-upholstered Victorian chairs; the carved faux narwhal tusk was a John Dickinson design; the Viennese art nouveau table with the House & Garden improvised dining setting. At gala openings, museum gatherings, and vernissages, Fred Lyon is the man with the sparkling eyes and superbly draped jacket who looks like Gregory Peck in “Roman Holiday”. Fred Lyon’s first rule of fashion is not to offend the eye or be gaudy. Second rule: Keep it simple. 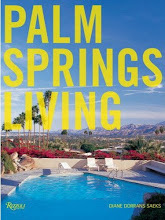 All photographs here are copyright Fred Lyon. No images may be used without express written permission of the photographer. The living rooms looks somewhat similar--it is the best angle--but you'll see that in the new shots in my book, the plaster tables are in place. 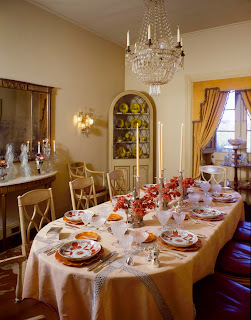 But the shots are a lot of the same--same bones in the room of the table and columns but furniture added and subtracted. A master photographer and a very interesting person, young and vibrant. The story of the truffle made me smile. Fred is just the BEST and you bring out the best of him! Thank you so much for your lovely recognition of the great Fred. He is such a gracious person, and such a raconteur. One sad detail I did not write about in the post: much of his great film was destroyed by Conde Nast when House & Garden was dismantled the first (of many) times...they threw out film. That was in the days, of course, of film...so it was gone forever. Fred fortunately saved the images we see on my blog, but otherwise...this is all he has. I always ask him for more and more--and he always says, 'Sorry, no more...that is it." This is incredible. What a man of taste Fred Lyon is!! I like his photographs. They look so alive and his attention to detail is also quite obvious in his photo. I could find something new in each time I look at them. That's a sign of a great photographer. I like his idea of keeping simple is the rule for being chic. 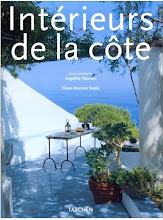 Talking about chic, I listened to an interesting interview with the interior designer John Stefanidis (my ultimate idol, I have all his books at home) on BBC Radio 3, a classical music channel. He is such a fascinating man with an impeccable taste. He speaks like a Partician or BBC World Services from pre-war era. You can listen to this interview online too. 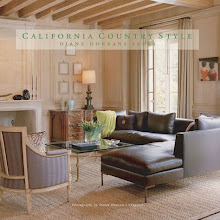 Again a wonderful post of you Diane! ABSOLUTELY BRILLIANT!! Thank you for in-depth insight on this incredible, talented man. What talent, Diane, thank you so much for sharing! Thank you for this wonderful, insightful look at a true legend. I must admit I knew of him, but not to this extent. The stories of his work with these absolute archtypes of design are priceless! Your work never fails to please. My goodness what an amazing post, you put so much into it. The photo's are wonderful, I think the bedroom is divine. What an interesting man, I love the line .. When he walks into a party, the whole room lights up. Think strobe lights! Thank you for adding DJA to your reading list and blog role, I will be adding you to mine. I just found your blog and to my surprise through a visitor of mine who had come from your blog. you have included me in your list of blog you follow for that I thnak you and for your bolg I say Bravo! 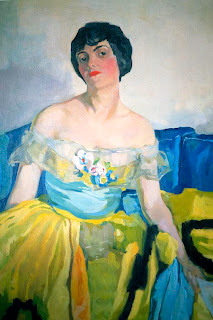 ; it is very interesting and superbly well done; I am in fact flattered that you visit me. thanks you et a bientot. What a fascinating post. The images are glorious and all the behind-the-scenes info so interesting. 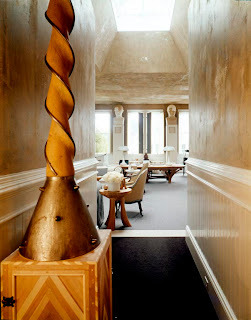 I love photographing interiors as a hobby and enjoyed this post immensely. Such a great post! Brilliant interview, and adorable pics, Have a sweet day! Diane, it's no surprise your blog is so incredible! I particularly love your insider perspectives on the realities of designing - precisely what is lacking in the written world of design. Bravo!